At Raleigh we build bikes that fit easily into your lifestyle. But we realize finding a bike is a process. We think it should be enjoyable. 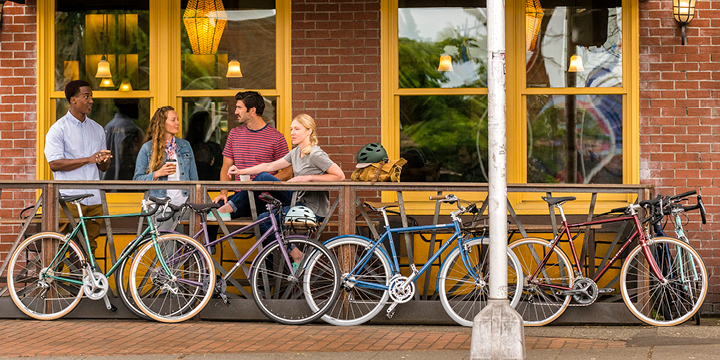 Follow these five steps to find the Raleigh bike that’s just for you. Picture your rides in as much detail as possible. Where are you? Maybe on city streets. Cruising the bike path with your kids. Or perhaps you just unpacked your Break-Away Grand Prix to go for a road ride while you’re on vacation. Next ask yourself what the terrain is like. Are you spinning up a hill? Is the road smooth or full of pot holes? Will you venture onto a dirt path or trail? Finally, ask yourself how long your rides will be. Do you see yourself going out for all-day adventures, quick trips to the store, or something in between? You might envision a mix of rides for both recreation and transportation. Line up your riding vision with the category of bikes that matches it. Road bikes, including Adventure and Endurance Road categories are great choices for those who are planning rides longer than about 15 miles on paved roads. Mountain bikes are best suited for those looking to hit dirt trails of any kind. Women’s-specific bikes are available in all categories. These bikes come in a size range and with touchpoints for women, reducing the need to swap parts to get the best fit. Designed for a broad range of city riding, our Urban categories let you show off your sense of style. Urban Fitness bikes offer a sporty look and combine the efficiency of a road bike with features to enhance your comfort, like flat bars and a more upright riding position. For an eye-catching look suited to casual riding, our Urban Heritage bikes can’t be beat. The Road Heritage collection offers traditional designs reminiscent of mid-20th century styles. Keep an open mind about which category to shop, though. For example, if you’re looking for a commuter bike, don’t limit yourself to only the Urban Commuter category. A bike like the Carlton 8 has great commuter features, like fenders, a rack, and gears to get you uphill. But for doing a 3-mile commute, the Superbe, in the Urban Heritage category, might be just right. Or, for a longer commute, you might prefer something like the Stuntman, found in our Road/Adventure category. It’s worth spending a bit more to get features that will give you the riding experience you envisioned in Step 1. For example, if you live in a wet climate, you’ll likely ride more often if you have disc brakes, which provide more control than rim or coaster brakes. If you plan to commute or run errands in street clothes, fenders are a must for keeping off road spray. Also consider how many gears you might need: More gears will help you ride longer without fatigue, especially up hills. Be realistic about what you can afford, but skimp too much and you might end up with a bike you don’t enjoy riding. Once you’ve zeroed in on your dream bike, decide which delivery and assembly option is right for you. If you’re mechanically inclined or have some experience working on bikes, Standard Home Delivery is a great option. Your bike will be partially assembled and then shipped to your door. You’ll finish assembling it yourself following the assembly guide included with your bike. We’ve also got some great videos to make it even easier. Prefer to have someone else put your bike together? We’ve got two free options, depending on availability in your area: local bike shop or Beeline Bikes. 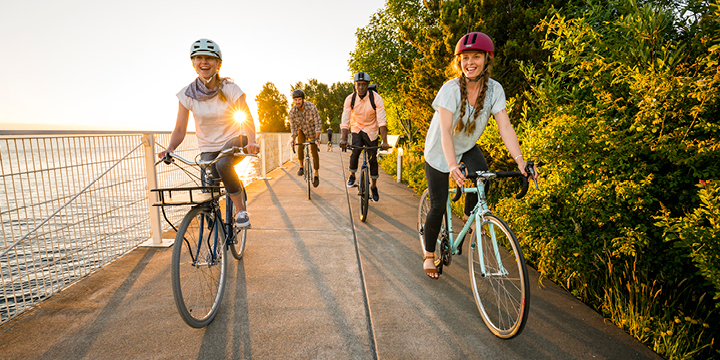 If a participating bike shop is available for your zip code and purchase type, you will be presented at checkout with options for bike shops located near you. We will ship your bike to the shop you select at checkout. A professional mechanic will assemble your bike, and you can then pick it up at the shop. Beeline Bikes is a mobile bike shop that will assemble your bike and deliver it you. You will be presented this delivery option at checkout if it is available in your location. We will ship your bike to the mobile Beeline bike mechanic in your area. The mechanic will assemble your bike and deliver it at the time you schedule. You’ll want to get a helmet if you don’t already have one. If you’ll be riding at night or in heavy city traffic, consider picking up a bright headlight and a flashing red taillight so you can see and be seen. You’ll also want to be prepared for the inevitable but occasional flat tire. Be sure to have a pump, spare tube, tire levers and a patch kit. Many pumps include hardware to attach the pump to the frame for easy carrying. A small saddle bag or frame bag fits on your bike to keep your tools handy. That’s it! If you need assistance during your shopping experience, you can always reach out to our knowledgeable customer service team. We are here to help you find a bike that you’ll enjoy riding for a long time.